“Not long ago I visited the limestone and chalk cliffs on the North Norfolk coast. As I walked below them I remember constantly looking up to the top of the cliffs, overwhelmed and cautious of the overbearing layers of rock that towered above me. Placing myself in relation to the cliffs made me feel so insignificant, so small, and so fragile. I was unable to understand both their overwhelming scale and materiality…. 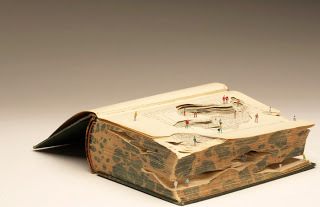 Kirkpatrick’s imagined landscape works by being carved from an archetypal monumental man-made object — a visual encyclopedia — taken out of context and populated with human figurines dwarfed by the swirling, layered cutaway text. What is he pushing us to see beyond what he presents before us? That this human work of attempting to understand and make sense of the great world around us by capturing it in words and illustrated plates is a shrinking and condensing, an implication of forms by artifice? That even though the landscape is man-made, it overwhelms us?